Frisner popped the audiocassette into his car’s player, and the music started. “Le voix là, le voix les anges, le voix là, le voix les cieux, nous prions qui sous la terre, sous la terre comme dans les cieux, le voix là, le voix les anges.” That was Frisner himself singing lead in the opening phrases of Makandal’s first album, A Trip to Voodoo. Makandal had recorded in Queens on a frosty day in January 1982. Summer was now closing, and ayibobo! We finally had a copy, and A Trip would be released any day now. The track continued, now in Kreyòl. “Nou tout se zany o, zany anbarase mwen…” “We are all angels, oh, angels surround me…” As if on cue, at 2 min 4 sec, the voice of an angel flew in. But what an angel! Her sound carried a curious and original blend of nasal resonance and ringing solidity. “Who’s that?” I asked Frisner. “Jocelyne.” I scolded myself for noticing Jocelyne’s special talent only now, then sat back to indulge in more. Marie Jocelyne Louis was born in Miragoâne, Haiti, on January 9, 1957, to the late Louis Jean-Louis and Léotude Civil. She had distinguished herself in soccer as a teen, but she stood out as well as a performer. Sixteen-year-old Jocelyne established La Troupe Makandal in 1973 in the Port-au-Prince community of Belair, where she was growing up and participating in the community’s rich Vodou legacy. The company named itself after an eighteenth-century revolutionary and mystic, one who performed feats of mind over matter. Most artists in the company incorporated magic into the act. All eight displayed dynamic personalities, and they were soon a favorite with Haitian audiences at community festivals. Of the two sisters, Carole grabbed attention first. Tall and slim, and flamboyant in nature, she specialized in a banda (decadent dance of the death spirits) that burned the stage and earned Makandal a reputation as bold–the real Vodou thing. Jocelyne could deliver a remarkable fire dance as well as any, but seemed more grounded in personality. A Trip to Voodoo revealed the secret of her dynamic voice, and when Makandal moved on to venues in Manhattan, she took a lead in the company’s staged Vodou dances. 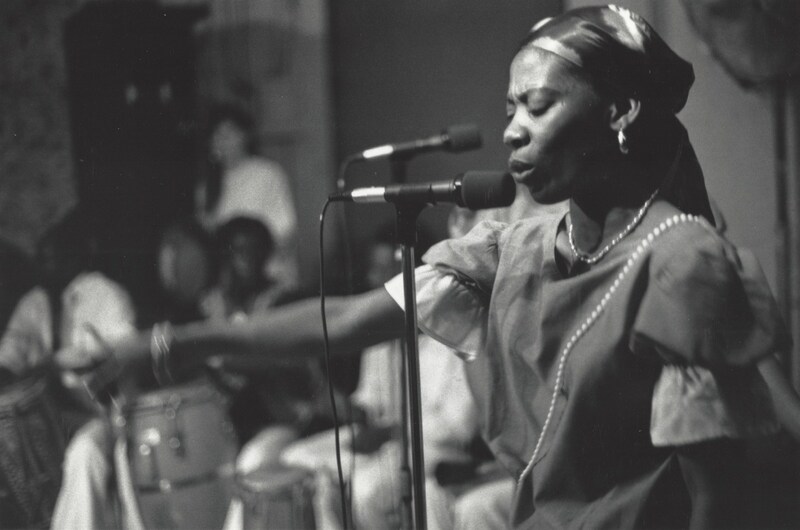 She recorded another audio set with Makandal in Spring Valley in 1984, which The Drums of Vodou CD later incorporated. The piece that Jocelyne most identified with, “Mirabo” (track 4), is part of the set, and it and accompanies the slide show below. 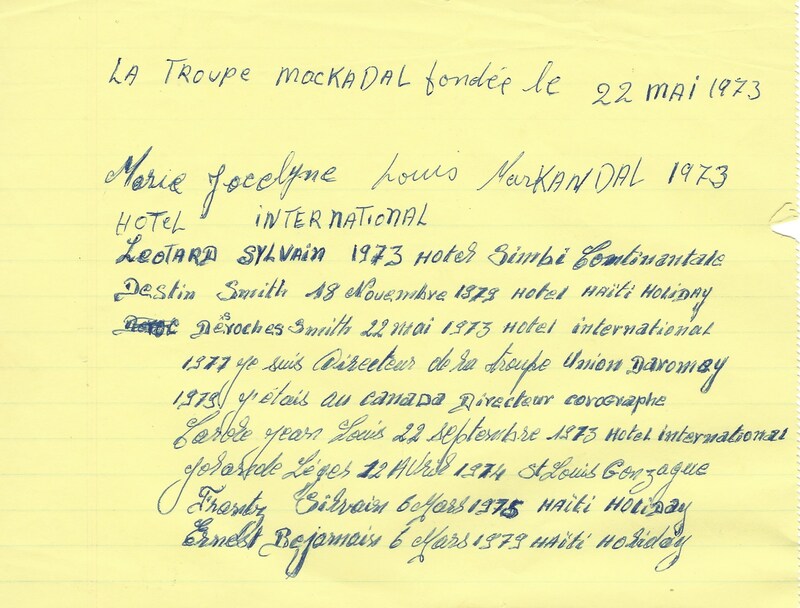 Jocelyne was above all an active Vodouyizan and distinguised herself in the societies of New York as an outstanding oundjenikon (song specialist) with a broad repertory. She achieved the status of manbo (priestess) as well. Jocelyne secured her residence in the United States with the 1987 amnesty. She traveled to Haiti and gradually played less with Makandal. She had no children, but was a loving aunt to her many nieces, nephews, and their children. She passed away in New York on July 22, 2016. We offer our condolences to the family, but we feel certain that her powerful voice now has the spirits of Ginen dancing. A special thank you to Carole Jean-Louis and Kethelyne Jean-Louis, for all you do. May your warm memories of Jocelyne bring you comfort in the days ahead. Please help Makandal continue to tell these stories from the Frisner Augustin Memorial Archive. Learn and get involved here. Contributions are tax-deductible. Thank you! Cover of the LP A Trip to Voodoo, recorded by Harry Leroy of Maniax Studios, released in 1982 by Gayrleen Records. Photo by Joel Pierre. Standing, from the left: Ernst Benjamin (Tinès), Luc Richard, Smith Destin, Carole Jean-Louis, Lois Wilcken, Jean Paul Joseph, Smith Desroches, and Yolande Leger. Seated, from the left: Jocelyne Louis, Frisner Augustin, Laurie Bleich, Bonnie Devlin, and Marie Léotard Sylvain. 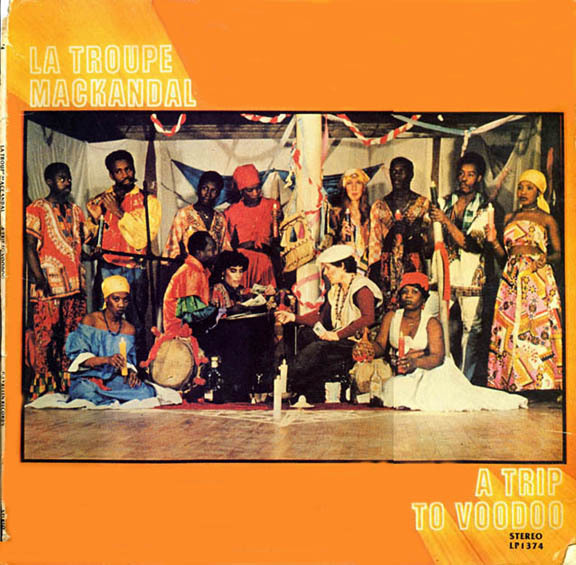 Audio selection from La Troupe Makandal’s A Trip to Voodoo (1982), track 1, “Lapriyè/Rada.” Lead vocals by Frisner Augustin (first two minutes) and Jocelyne Louis (from 2 min, 4 sec). This entry was posted in Tales from the Archive and tagged Archive, Dance, Drumming, Drums, Frisner Augustin, Haiti, Haitian, Haitian Dance, Haitian Music, Music, Vodou. Bookmark the permalink.